Your daughter-in-law is not the first Jew to explore Eastern religions, nor the first Jew to seek spirituality beyond the prayerbook. In fact, Judaism has a long history of individuals seeking spirituality and in the past century alone we’ve seen a lot of influence from Eastern religions. All of this is to say you need not worry that your daughter-in-law’s spiritual interests will confuse your grandchild. 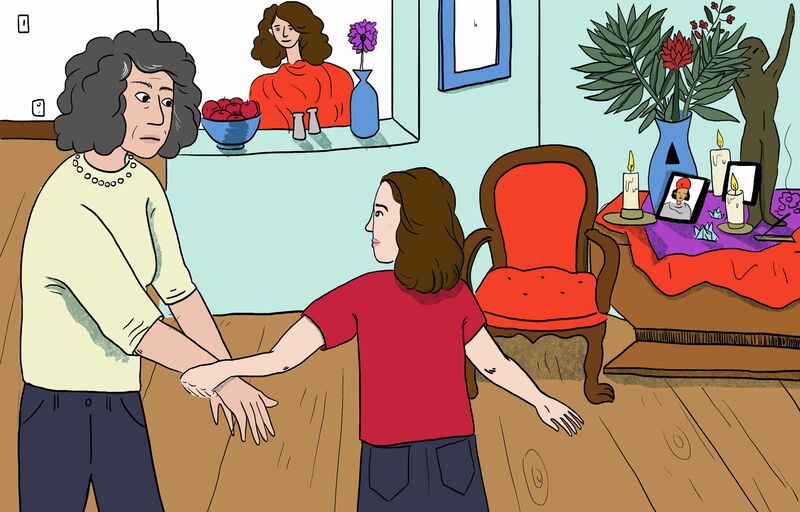 There are many resources within the Jewish community that could speak to these interests and you could play a role in introducing your family to them. This could mean finding a local Jewish meditation group for them to join, or sending her reading materials. You might even want to invite your daughter-in-law to join you in a Jewish Renewal weekend. A good place to start would be sending her the book “The Jew in the Lotus” by Rodger Kamenetz in which the Dalai Lama suggests that Jews attracted to Buddhist practice also look at their own Jewish backgrounds for inspiration. Coming from the Dalai Lama himself, this argument might pique her interest in expanding her learning more about her in her Jewish roots. You yourself might gain some insight from reading Rosie Rosenzweig’s 1998 book, “A Jewish Mother in Shangri-La,” in which she chronicles her journey following her son as he explored Eastern spirituality. The truth is, you could also grow from this. Use this as an opportunity to educate yourself about Jewish spirituality in the 21st century. Then you can share everything you have learned with your daughter-in-law. Dr. Ruth Nemzoff, author of “Don’t Bite Your Tongue: How to Foster Rewarding Relationships with Your Adult Children” and “Don’t Roll Your Eyes: Making In-Laws into Family” is a resident scholar at The Brandeis Women’s Studies Research Center. She is on the Board of Interfaithfamily.